Our efforts are the same and our mission remains providing creative arts therapy to trauma victims. We thank you in advance for your support of Shine MSD and we hope you will share our new campaign with your friends, family, and community. Following the shooting tragedy at Marjory Stoneman Douglas (MSD) High School on February 14, 2018, members of the MSD Drama Club came together to provide comfort to each other and students affected by the tragedy. Sawyer Garrity and Andrea Pena, MSD Drama Club members, began writing a song entitled “Shine”. Their approach did not start from anger, but rather from a place of healing. A Town Hall Meeting at the BB & T Center in Sunrise, Florida was quickly organized and broadcast live on CNN on February 21, 2018, which was broadcast live to 3 million people. The event was rife with emotion and concluded with the MSD Drama Club members performing the song “Shine”. The performance of the song was significant, encouraging the community to come together and heal from this horrific tragedy. The Town Hall broadcast launched "Shine" into the spotlight. It was immediately decided that any proceeds generated by the song or other works of art generated by our students should be directed towards healing. Thus, Shine MSD was born. The purpose of Shine MSD is to help victims of trauma heal through creative arts therapy. 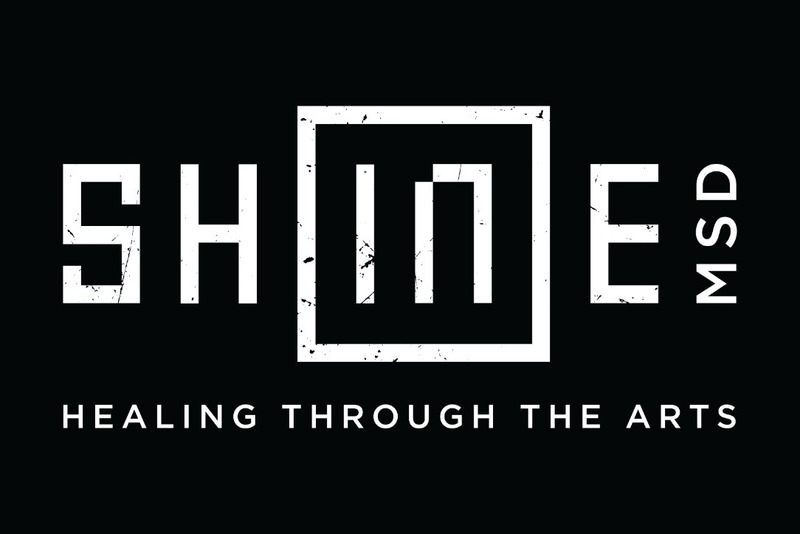 Shine MSD exists to provide healing through the arts for trauma victims, with a specific emphasis on those affected by the tragedy at MSD High School. The intent is to create, and broadcast, the healing message from the students of MSD High School through various mediums throughout the world. All of Shine MSD board members have children in the MSD Drama Club. Shine MSD is a 501(c)(3) charitable organization committed to helping those affected by trauma. All donations are tax deductible. Camp Shine was started in the summer of 2018. The purpose of the camp was to bring licensed therapists that specialized in healing through the arts together with students from Marjory Stoneman Douglas High School. The results were amazing. Students that were closed off from the world since 2/14/18 began to open up and express their feelings through the different creative and visual art mediums. The students soon learned that they were all "In It Together" . and making a tax-deductible donation to our 501(c)(3) charitable organization. Have you heard the powerful lyrics that our #CampShine Participants wrote in conjunction with Music Ascension, Lane Gardner and our music therapist Bree Gordon Lukosavich? If you haven’t listened, please share and let us know what you think! Monday, June 18, 2018, marked the opening day of our new endeavor, Camp Shine. Shine MSD is on a mission to help unite the Parkland/Coral Springs community through powerful Creative Arts Therapy, a fun, insightful, and effective way of healing through the arts. Starting with a series of summer programs for students (Camp Shine) and programs for adults, the ultimate goal is to develop a range of opportunities for Shine MSD to broaden its healing influence by creating and implementing self-sustaining programs that not only bring the community together, but serve as a blueprint for future endeavors. We brought in experts to lead the charge for its first endeavor: Camp Shine. These experts are some of the nation’s leading creative arts’ therapists and public health experts as well as Emmy-awarding winning & Oscar nominated TV/Film producers who bring their collective expertise to project manage and create these groundbreaking programs. Camp Shine is a summer camp for students of MSD High School aimed at healing through the creative arts. Focused on storytelling with fun and therapeutic activities, Camp Shine uses drama, storytelling, visual arts, and music as way to connect kids to each other and to their own emotions. This work provides a much needed and deeply therapeutic outlet for kids from various backgrounds in the school - especially students who have never thought of themselves as “artists”. In short, it is the perfect blend of art and science resulting in powerful alternative therapy. The programs are developed by Jessica Asch, a highly accomplished Creative Arts and Registered Drama Therapist. Our therapists have worked together to devise a highly flexible program that evolves based on the needs of the participants. Sometimes they will work together and other times be split into groups: Theater, Music, and Art. Each group will work on individual projects ranging from photography installations to song writing to monologues and improv “shows” as well as group projects to be presented in some way at the end of camp. The idea is that each project tells a story - which will allow students to express themselves in a fun way while providing a connection with other students - and a way to heal through the arts . What Does Camp Shine Look Like? Each day will start with a 30-minute warm-up activity in the auditorium aimed at connecting and opening up the students to the day’s work. The warm-ups will vary day-to-day and will always be led by one of the therapists. Some days the warm-ups will consist of all three art forms and others may focus on either theater games, music, or art. After the warm-up the students will split into three groups: drama therapy, music therapy, and art therapy. The students come back together at the end of the day to close-up the camp session as a group. While our overall mission is to provide alternative therapy programs focused on healing through the arts to the grieving and fractured Stoneman Douglas Community, we recognize the power of national attention. By harnessing this attention in the form of bringing in professionals from all over the nation, we will not only create repeatable methodologies but study them with the nation’s leading trauma researchers. Ultimately, the programs and their studies will influence what we know about alternative therapy all over the world and could affect public access to alternative therapies at a federal level through changing public policy. Over the summer, the team will lead CAMP SHINE: a series of summer camps for students based in Creative Arts Therapy. Through this process, local counselors are trained in how to continue the program long term throughout the school year and future summers. From CAMP SHINE, The Shine Method is created. The Shine Method is a repeatable program that can be modified and offered to other communities experiencing shared trauma. The University of Miami is conducting an IRB-approved research study on CAMP SHINE as it relates to trauma. This study will provide future facilitators with evidence-based information to modify and perfect their methods. These findings and the academic endorsement from University of Miami could influence public policy surrounding alternative and creative arts therapies in schools and other institutions. In addition, the team will use their shared resources and contacts to create, develop, and implement additional community programs designed specifically for populations who may otherwise be left out such as victims' families, middle schoolers, nurses, and first responders. On February 14, 2018, the unspeakable occurred in Parkland. The community was shocked and lives were shattered. While we’ve all seen the stories of unity and resilience filling the news, the members of the Parkland/Coral Springs community understand that those stories are national headlines and only show one side of a complex, ever-evolving story. On the ground, students and adults alike are still separated. Whether it be adults disagreeing on what should be done to keep the community safe or typical high school drama (amplified by shared trauma) tearing apart friend groups, there’s still a very real disconnect in the community. Summer is here and the divide is widening. It’s crucial that we help the community write our own story by creating fun and therapeutic ways to unite, heal and continue to hold each other up. Camp Shine and its related programs create a pattern of shared resilience, while encouraging the community to continually come together, especially leading up to the 2018-2019 School year - a year full of triggers. Starting with the first day of school all the way to graduation, the year is full of re-traumatizing landmines. Shortly after the start of the school year, the triggers of the holiday season build right up until the first anniversary of the shooting, which will be a very traumatizing time for all. Only a few weeks after the first anniversary, will be the first school dances and graduation with some of the victims. Our therapists will work with teachers, families and administrators to recognize behavior changes and to hold therapeutic space for all in need. And as Parkland continues to make headlines, we know the world is still watching - waiting to see what amazing things the community will do next. While we have this attention, we can harness the power of professional community support to create self-sustaining programs. Once the ball is rolling, these Shine Methods can go a step further in making change around the world for better - by bringing programs to other communities in need.